All is right with the world when I am able to participate in Happy Homemaker Monday! Sandra over at Diary of a Stay at Home Mom is our weekly host and l love to "link up" with the other bloggers who participate in Happy Homemaker Monday:) So, let's get started! The weather is glorious! Blue sky, sunshine, green grass, beautiful flowers--ahhh, Spring! I think the temperature will be in the low 70s (F) today but building into the 80s by the end of the week! I am sooo ready!!! Sitting in my chair, still in my jammies:) Just finished breakfast, read my email (and just a little Pinterest). I need to get on with my day! About all the cards I need to get made in the next few days! Shall I call this a "card crunch"?!! Some people go out and buy cards when they are needed but my family and friends have come to expecthandmade cards from me so I need to get them done even if I'm not feeling particularly motivated! I really wasn't motivated ALL last week but need to get motivated asap! I plan to do a lot of reading this week. I don't have a clue what we're eating this week! Time to go grocery shopping, I think! Lots of food in the house but nothing to eat; ever been there? Go through clothes closet and purge!!! Happy Stampers on Wednesday:) Love spending time with the ladies being creative! Right now just cards but should have a lot to show over the next week! Really, this week I will! A day home alone...occasionally! I love my family but sometimes it is just nice to have a whole day to myself! This is more of a beauty tip: I use coconut oil to wash my face! It is antibacterial, antifungal and antiviral! How can you beat that?!!! In addition to washing my face with coconut oil, I also use it as a moisturizer when I need one (usually don't when washing with coconut oil). It makes my skin amazingly soft and free of blemishes. Hubby got two of these huge flower baskets for our deck...so pretty! My sister still recovering from hip replacement surgery, then broken femur surgery, then blood clot! Still improving but not out of the woods yet! Friend selling (sold) her house then going to live near her son and DIL; needs to find motor home to live in. Kat... you know I really enjoyed your A-Z posts but this one got me started! Lifting your prayers up! Thanks for always inspiring me to do more an be more! Thank you Cary! I appreciate you lifting my prayers up:) I enjoyed my visit to your blog! Love this! I am off to begin this project too! Woo Hoo! 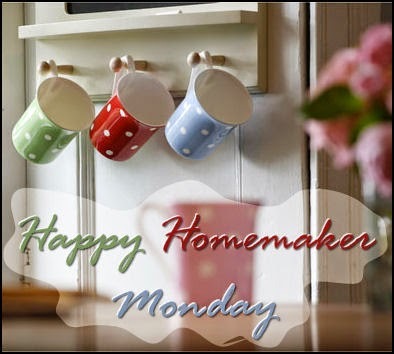 Happy Homemaker Monday is fun! I will trot off to read your post! My parents always liked having those hanging baskets around the house. Hubby loves flowers everywhere! Those baskets are HUGE but gorgeous! And I love your flowers on the deck, just beautiful. Thanks, Sandra! Most of the family does appreciate it.